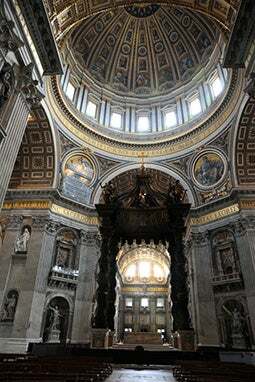 The largest church building in the world, St. Peter’s Basilica in the Vatican City, covers about 240,000 square feet and contains 11 chapels and 45 altars. Named for the apostle Peter, many people believe that the church houses his tomb. The basilica’s great dome rises 240 feet above the ground. It’s estimated that the building cost $48 million to complete. It contains some of the world’s most outstanding artwork, some of which dates to the fourth century, when the original structure was built by the Roman emperor Constantine I. The current basilica was built during the 16th century. Some of the funds raised for its construction came from selling letters of indulgences. When the priest Martin Luther found out about this, his outrage led to a split in the church and the Great Reformation.